Hot Jupiters are a class of gas giant exoplanets that are inferred to be physically similar to Jupiter but that have very short orbital periods (P<10 days). The close proximity to their stars and high surface-atmosphere temperatures resulted in the moniker "hot Jupiters". Hot Jupiters are the easiest extrasolar planets to detect via the radial-velocity method, because the oscillations they induce in their parent stars' motion are relatively large and rapid compared to those of other known types of planets. One of the best-known hot Jupiters is 51 Pegasi b. Discovered in 1995, it was the first extrasolar planet found orbiting a Sun-like star. 51 Pegasi b has an orbital period of about 4 days. Though there is diversity among hot Jupiters, they do share some common properties. Their defining characteristics are their large masses and short orbital periods, spanning 0.36–11.8 Jupiter masses and 1.3–111 Earth days. The mass cannot be greater than approximately 13.6 Jupiter masses because then the planet would start burning deuterium and become a brown dwarf. Most have nearly circular orbits (low eccentricities). It is thought that their orbits are circularized by perturbations from nearby stars or tidal forces. Many have unusually low densities. The lowest one measured thus far is that of TrES-4 at 0.222 g/cm3. The large radii of hot Jupiters are not yet fully understood but it is thought that the expanded envelopes can be attributed to high stellar irradiation, high atmospheric opacities, possible internal energy sources, and orbits close enough to their stars for the outer layers of the planets to exceed their Roche limit and be pulled further outward. Usually they are tidally locked, with one side always facing its host star. They are likely to have extreme and exotic atmospheres due to their short periods, relatively long days, and tidal locking. Atmospheric dynamics models predict strong vertical stratification with intense winds and super-rotating equatorial jets driven by radiative forcing and the transfer of heat and momentum. The day-night temperature difference at the photosphere is predicted to be substantial, approximately 500 K for a model based on HD 209458b. They appear to be more common around F- and G-type stars and less so around K-type stars. Hot Jupiters around red dwarfs are very rare. Generalizations about the distribution of these planets must take into account the various observational biases, but in general their prevalence decrease exponentially as a function of the absolute stellar magnitude. There are two general schools of thought regarding the origin of hot Jupiters: formation at a distance followed by inward migration and in-situ formation at the distances at which they're currently observed. The prevalent view is formation via orbital migration. In the migration hypothesis, a hot Jupiter forms beyond the frost line, from rock, ice, and gases via the core accretion method of planetary formation. The planet then migrates inwards to the star where it eventually forms a stable orbit. The planet may have migrated inward smoothly via type II orbital migration. Or it may have migrated more suddenly due to gravitational scattering onto eccentric orbits during an encounter with another massive planet, followed by the circularization and shrinking of the orbits due to tidal interactions with the star. A hot Jupiter's orbit could also have been altered via the Kozai mechanism, causing an exchange of inclination for eccentricity resulting in a high eccentricity low perihelion orbit, in combination with tidal friction. This requires a massive body—another planet or a stellar companion—on a more distant and inclined orbit; approximately 50% of hot Jupiters have distant Jupiter-mass or larger companions, which can leave the hot Jupiter with an orbit inclined relative to the star's rotation. The type II migration happens during the solar nebula phase, i.e. when gas is still present. Energetic stellar photons and strong stellar winds at this time remove most of the remaining nebula. Migration via the other mechanism can happen after the loss of the gas disk. Instead of being gas giants that migrated inward, in an alternate hypothesis the cores of the hot Jupiters began as more common super-Earths which accreted their gas envelopes at their current locations, becoming gas giants in situ. The super-Earths providing the cores in this hypothesis could have formed either in situ or at greater distances and have undergone migration before acquiring their gas envelopes. Since super-Earths are often found with companions, the hot Jupiters formed in situ could also be expected to have companions. The increase of the mass of the locally growing hot Jupiter has a number of possible effects on neighboring planets. If the hot Jupiter maintains an eccentricity greater than 0.01, sweeping secular resonances can increase the eccentricity of a companion planet, causing it to collide with the hot Jupiter. The core of the hot Jupiter in this case would be unusually large. If the hot Jupiter's eccentricity remains small the sweeping secular resonances could also tilt the orbit of the companion. Traditionally, the in situ mode of conglomeration has been disfavored because the assembly of massive cores, which is necessary for the formation of hot Jupiters, requires surface densities of solids ≈ 104 g/cm2, or larger. Recent surveys, however, have found that the inner regions of planetary systems are frequently occupied by super-Earth type planets. If these super-Earths formed at greater distances and migrated closer, the formation of in situ hot Jupiters is not entirely in situ. If the atmosphere of a hot Jupiter is stripped away via hydrodynamic escape, its core may become a chthonian planet. The amount of gas removed from the outermost layers depends on the planet's size, the gases forming the envelope, the orbital distance from the star, and the star's luminosity. In a typical system, a gas giant orbiting at 0.02 AU around its parent star loses 5–7% of its mass during its lifetime, but orbiting closer than 0.015 AU can mean evaporation of a substantially larger fraction of the planet's mass. No such objects have been found yet and they are still hypothetical. Simulations have shown that the migration of a Jupiter-sized planet through the inner protoplanetary disk (the region between 5 and 0.1 AU from the star) is not as destructive as one might assume. More than 60% of the solid disk materials in that region are scattered outward, including planetesimals and protoplanets, allowing the planet-forming disk to reform in the gas giant's wake. In the simulation, planets up to two Earth masses were able to form in the habitable zone after the hot Jupiter passed through and its orbit stabilized at 0.1 AU. Due to the mixing of inner-planetary-system material with outer-planetary-system material from beyond the frost line, simulations indicated that the terrestrial planets that formed after a hot Jupiter's passage would be particularly water-rich. According to a 2011 study, hot Jupiters may become disrupted planets while migrating inwards; this could explain an abundance of "hot" Earth-sized to Neptune-sized planets within 0.2 AU of their host star. In 2015, two planets were discovered around WASP-47. One was potentially a large terrestrial planet, of less than 22 Earth masses and 1.8 Earth radii. The other is of similar mass at 15.2 Earth masses, but with 3.6 Earth radii it is almost certainly a gas giant. They orbit on either side of a previously discovered hot Jupiter, with the smaller, terrestrial planet closer in. A similar orbital architecture is also exhibited by the Kepler-30 system. It has been found that several hot Jupiters have retrograde orbits and this calls into question the theories about the formation of planetary systems, although rather than a planet's orbit having been disturbed, it may be that the star itself flipped over early in their system's formation due to interactions between the star's magnetic field and the planet-forming disc. 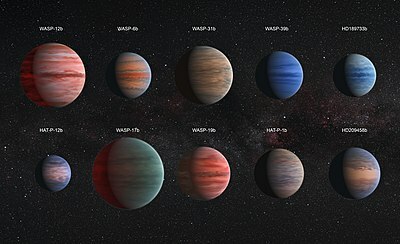 By combining new observations with the old data it was found that more than half of all the hot Jupiters studied have orbits that are misaligned with the rotation axis of their parent stars, and six exoplanets in this study have retrograde motion. Recent research has found that several hot Jupiters are in misaligned systems. This misalignment may be related to the heat of the photosphere the hot Jupiter is orbiting. There are many proposed theories as to why this might occur. One such theory involves tidal dissipation and suggests there is a single mechanism for producing hot Jupiters and this mechanism yields a range of obliquities. Cooler stars with higher tidal dissipation damps the obliquity (explaining why hot Jupiters orbiting cooler stars are well aligned) while hotter stars do not damp the obliquity (explaining the observed misalignment). Ultra-short period planets (USP) are a class of planets with orbital periods below one day and occur only around stars of less than about 1.25 solar masses. Five ultra-short period planet candidates have been identified in the region of the Milky Way known as the galactic bulge. They were observed by the Hubble Space Telescope and first described by researchers from the Space Telescope Science Institute, the Universidad Catolica de Chile, Uppsala University, the High Altitude Observatory, the INAF–Osservatorio Astronomico di Padova, and the University of California, Los Angeles. Confirmed transiting hot Jupiters that have orbital periods of less than one day include WASP-18b, WASP-19b, WASP-43b, and WASP-103b. Other ultra-short period planets include K2-141b, a rocky Super-Earth with a period of 0.28 days orbiting the host star K2-141 (EPIC 246393474). Gas giants with a large radius and very low density are sometimes called "puffy planets" or "hot Saturns", due to their density being similar to Saturn's. Puffy planets orbit close to their stars so that the intense heat from the star combined with internal heating within the planet will help inflate the atmosphere. Six large-radius low-density planets have been detected by the transit method. In order of discovery they are: HAT-P-1b, COROT-1b, TrES-4, WASP-12b, WASP-17b, and Kepler-7b. Some hot Jupiters detected by the radial-velocity method may be puffy planets. Most of these planets are below two Jupiter masses as more massive planets have stronger gravity keeping them at roughly Jupiter's size. Even when taking surface heating from the star into account, many transiting hot Jupiters have a larger radius than expected. This could be caused by the interaction between atmospheric winds and the planet's magnetosphere creating an electric current through the planet that heats it up, causing it to expand. The hotter the planet, the greater the atmospheric ionization, and thus the greater the magnitude of the interaction and the larger the electric current, leading to more heating and expansion of the planet. This theory matches the observation that planetary temperature is correlated with inflated planetary radii. Theoretical research suggests that hot Jupiters are unlikely to have moons, due to both a small Hill sphere and the tidal forces of the stars they orbit, which would destabilize any satellite's orbit, the latter process being stronger for larger moons. This means that for most hot Jupiters, stable satellites would be small asteroid-sized bodies. In spite of this, observations of WASP-12b suggest that it is orbited by at least 1 large exomoon. It has been proposed that gas giants orbiting red giants at distances similar to that of Jupiter could be hot Jupiters due to the intense irradiation they would receive from their stars. It is very likely that in the Solar System Jupiter will become a hot Jupiter after the transformation of the Sun into a red giant. The recent discovery of particularly low density gas giants orbiting red giant stars supports this theory. Hot Jupiters orbiting red giants would differ from those orbiting main-sequence stars in a number of ways, most notably the possibility of accreting material from the stellar winds of their stars and, assuming a fast rotation (not tidally locked to their stars), a much more evenly distributed heat with many narrow-banded jets. Their detection using the transit method would be much more difficult due to their tiny size compared to the stars they orbit, as well as the long time needed (months or even years) for one to transit their star as well as to be occulted by it. Theoretical research since 2000 suggested that "hot Jupiters" may cause increased flaring due to the interaction of the magnetic fields of the star and its orbiting exoplanet, or because of tidal forces between them. These effects are called "star-planet interactions" or SPIs. The HD 189733 system is the best-studied exoplant system where this effect was thought to occur. In 2008, a team of astronomers first described how as HD 189733 b reaches a certain place in its orbit, it causes increased stellar flaring in its host star. In 2010, a different team found that every time they observe the exoplanet at a certain position in its orbit, they also detected X-ray flares. In 2019, astronomers combined data from Arecibo Observatory, MOST, and the Automated Photoelectric Telescope, in addition to historical observations of the star at radio, optical, ultraviolet, and X-ray wavelengths to examine these claims. Their analysis found that the previous claims were exaggerated and the host star failed to display many of the brightness and spectral characteristics associated with stellar flaring and solar active regions, including sunspots. They also found that the claims did not stand up to statistical analysis, given that many stellar flares are seen regardless of the position of the exoplanet, therefore debunking the earlier claims. The magnetic fields of the host star and exoplanet do not interact, and this system is no longer believed to have a "star-planet interaction." ^ "What worlds are out there?". Canadian Broadcasting Corporation. 25 August 2016. Retrieved 5 June 2017. ^ "Hot Jupiter with hidden Water". spacetelescope.org. ESA/Hubble. Retrieved 13 June 2016. ^ a b Winn, Joshua N.; Fabrycky, Daniel; Albrecht, Simon; Johnson, John Asher (2010-01-01). "Hot Stars with Hot Jupiters Have High Obliquities". The Astrophysical Journal Letters. 718 (2): L145. arXiv:1006.4161. Bibcode:2010ApJ...718L.145W. doi:10.1088/2041-8205/718/2/L145. ISSN 2041-8205. ^ "Astronomy & Astrophysics (A&A)". www.aanda.org. Retrieved 2016-04-15. ^ Fabrycky, D.; Tremaine, S. (2007-11-10). "Shrinking Binary and Planetary Orbits by Kozai Cycles with Tidal Friction". Astrophysical Journal. 669 (2): 1298–1315. arXiv:0705.4285. Bibcode:2007ApJ...669.1298F. doi:10.1086/521702. ^ a b Mandushev, Georgi; O'Donovan, Francis T.; Charbonneau, David; Torres, Guillermo; Latham, David W.; Bakos, Gáspár Á.; Dunham, Edward W.; Sozzetti, Alessandro; Fernández, José M. (2007-10-01). "TrES-4: A Transiting Hot Jupiter of Very Low Density". The Astrophysical Journal. 667 (2): L195–L198. arXiv:0708.0834. Bibcode:2007ApJ...667L.195M. doi:10.1086/522115. ^ Burrows, A.; Hubeny, I.; Budaj, J.; Hubbard, W. B. (2007-01-01). "Possible Solutions to the Radius Anomalies of Transiting Giant Planets". The Astrophysical Journal. 661 (1): 502–514. arXiv:astro-ph/0612703. Bibcode:2007ApJ...661..502B. doi:10.1086/514326. ISSN 0004-637X. ^ Cooper, Curtis S.; Showman, Adam P. (2005-01-01). "Dynamic Meteorology at the Photosphere of HD 209458b". The Astrophysical Journal Letters. 629 (1): L45. arXiv:astro-ph/0502476. Bibcode:2005ApJ...629L..45C. doi:10.1086/444354. ISSN 1538-4357. ^ a b Rauscher, Emily; Menou, Kristen (2010-01-01). "Three-dimensional Modeling of Hot Jupiter Atmospheric Flows". The Astrophysical Journal. 714 (2): 1334–1342. arXiv:0907.2692. Bibcode:2010ApJ...714.1334R. doi:10.1088/0004-637X/714/2/1334. ISSN 0004-637X. ^ F. J. Ballesteros; A. Fernandez-Soto; V. J. Martinez (2019). "Title: Diving into Exoplanets: Are Water Seas the Most Common?". Astrobiology. doi:10.1089/ast.2017.1720. PMID 30789285. ^ Dawson, Rebekah I.; Johnsom, John Asher (2018). "Origins of Hot Jupiters". Annual Review of Astronomy and Astrophysics. 56: 175–221. arXiv:1801.06117. doi:10.1146/annurev-astro-081817-051853. ^ Chambers, John (2007-07-01). Planet Formation with Type I and Type II Migration. AAS/Division of Dynamical Astronomy Meeting. 38. Bibcode:2007DDA....38.0604C. ^ D'Angelo, Gennaro; Durisen, Richard H.; Lissauer, Jack J. (December 2010). "Giant Planet Formation". In Seager, Sara (ed.). Exoplanets. University of Arizona Press. pp. 319–346. arXiv:1006.5486. Bibcode:2010exop.book..319D. ISBN 978-0-8165-2945-2. ^ D'Angelo, G.; Lubow, S. H. (2008). "Evolution of Migrating Planets Undergoing Gas Accretion". The Astrophysical Journal. 685 (1): 560–583. arXiv:0806.1771. Bibcode:2008ApJ...685..560D. doi:10.1086/590904. ^ Knutson, Heather A.; Fulton, Benjamin J.; Montet, Benjamin T.; Kao, Melodie; Ngo, Henry; Howard, Andrew W.; Crepp, Justin R.; Hinkley, Sasha; Bakos, Gaspar Á (2014-01-01). "Friends of Hot Jupiters. I. A Radial Velocity Search for Massive, Long-period Companions to Close-in Gas Giant Planets". The Astrophysical Journal. 785 (2): 126. arXiv:1312.2954. Bibcode:2014ApJ...785..126K. doi:10.1088/0004-637X/785/2/126. ISSN 0004-637X. ^ Rafikov, Roman R. (2006-01-01). "Atmospheres of Protoplanetary Cores: Critical Mass for Nucleated Instability". The Astrophysical Journal. 648 (1): 666–682. arXiv:astro-ph/0405507. Bibcode:2006ApJ...648..666R. doi:10.1086/505695. ISSN 0004-637X. ^ Hayashi, Chushiro (1981-01-01). "Structure of the Solar Nebula, Growth and Decay of Magnetic Fields and Effects of Magnetic and Turbulent Viscosities on the Nebula". Progress of Theoretical Physics Supplement. 70: 35–53. Bibcode:1981PThPS..70...35H. doi:10.1143/PTPS.70.35. ISSN 0375-9687. Archived from the original on 2015-02-19. ^ D'Angelo, G.; Bodenheimer, P. (2016). "In Situ and Ex Situ Formation Models of Kepler 11 Planets". The Astrophysical Journal. 828 (1): in press. arXiv:1606.08088. Bibcode:2016ApJ...828...33D. doi:10.3847/0004-637X/828/1/33. ^ Mayor, M.; Marmier, M.; Lovis, C.; Udry, S.; Ségransan, D.; Pepe, F.; Benz, W.; Bertaux, J.-L.; Bouchy, F. (2011-09-12). "The HARPS search for southern extra-solar planets XXXIV. Occurrence, mass distribution and orbital properties of super-Earths and Neptune-mass planets". arXiv:1109.2497 [astro-ph]. ^ Batalha, Natalie M.; Rowe, Jason F.; Bryson, Stephen T.; Barclay, Thomas; Burke, Christopher J.; Caldwell, Douglas A.; Christiansen, Jessie L.; Mullally, Fergal; Thompson, Susan E. (2013-01-01). "Planetary Candidates Observed by Kepler. III. Analysis of the First 16 Months of Data". The Astrophysical Journal Supplement Series. 204 (2): 24. arXiv:1202.5852. Bibcode:2013ApJS..204...24B. doi:10.1088/0067-0049/204/2/24. ISSN 0067-0049. ^ "Exoplanets Exposed to the Core". 2009-04-25. Retrieved 2009-04-25. ^ a b Fogg, Martyn J.; Nelson, Richard P. (2007), "On the formation of terrestrial planets in hot-Jupiter systems", Astronomy and Astrophysics, 461 (3): 1195–1208, arXiv:astro-ph/0610314, Bibcode:2007A&A...461.1195F, doi:10.1051/0004-6361:20066171. ^ Nayakshin, Sergei (20 September 2011). "Hot Super Earths: disrupted young jupiters?". Monthly Notices of the Royal Astronomical Society. 416 (4): 2974–2980. arXiv:1103.1846. Bibcode:2011MNRAS.416.2974N. doi:10.1111/j.1365-2966.2011.19246.x. Retrieved 25 December 2017. ^ Becker, Juliette C.; et al. (10 August 2015). "WASP-47: A Hot Jupiter System with Two Additional Planets Discovered by K2". The Astrophysical Journal Letters (Letter). IOP Publishing (published October 2015). 812 (2): L18. arXiv:1508.02411. Bibcode:2015ApJ...812L..18B. doi:10.1088/2041-8205/812/2/L18. The mass of WASP-47d is 15.2±7 M⊕. Only an upper limit can be placed on WASP-47e of <22M⊕. ^ [NULL]. "Kepler: A far-off solar system". kepler.nasa.gov. Retrieved 2016-08-02. ^ "Turning planetary theory upside down", ESO Press Release, Royal Astronomical Society: 16, 2010-04-13, Bibcode:2010eso..pres...16. ^ Tilting stars may explain backwards planets, New Scientist, 01 September 2010, Magazine issue 2776. ^ Hebrard, G.; Desert, J.-M.; Diaz, R. F.; Boisse, I.; Bouchy, F.; Etangs, A. Lecavelier des; Moutou, C.; Ehrenreich, D.; Arnold, L. (2010). "Observation of the full 12-hour-long transit of the exoplanet HD80606b. Warm-Spitzer photometry and SOPHIE spectroscopy". Astronomy and Astrophysics. 516: A95. arXiv:1004.0790. Bibcode:2010A&A...516A..95H. doi:10.1051/0004-6361/201014327. ISSN 0004-6361. ^ Triaud, A. H. M. J.; Queloz, D.; Bouchy, F.; Moutou, C.; Collier Cameron, A.; Claret, A.; Barge, P.; Benz, W.; Deleuil, M. (2009-10-01). "The Rossiter-McLaughlin effect of CoRoT-3b and HD 189733b" (PDF). Astronomy and Astrophysics. 506 (1): 377–384. arXiv:0907.2956. Bibcode:2009A&A...506..377T. doi:10.1051/0004-6361/200911897. ISSN 0004-6361. ^ a b Malavolta, Luca; et al. (9 February 2018). "An Ultra-short Period Rocky Super-Earth with a Secondary Eclipse and a Neptune-like Companion around K2-141". The Astronomical Journal. 155 (3): 107. arXiv:1801.03502. doi:10.3847/1538-3881/aaa5b5. ^ a b Sahu; et al. (2006). "Transiting extrasolar planetary candidates in the Galactic bulge" (abstract). Nature. 443 (7111): 534–540. arXiv:astro-ph/0610098. Bibcode:2006Natur.443..534S. doi:10.1038/nature05158. PMID 17024085. ^ "WASP Planets". wasp-planets.net. 5 December 2013. Retrieved 1 April 2018. ^ Chang, Kenneth (2010-11-11). "Puzzling Puffy Planet, Less Dense Than Cork, Is Discovered". The New York Times. ^ Ker Than (2006-09-14). "Puffy 'Cork' Planet Would Float on Water". Space.com. Retrieved 2007-08-08. ^ "Puffy planet poses pretty puzzle". BBC News. 2006-09-15. Retrieved 2010-03-17. ^ Batygin, Konstantin; Stevenson, David J.; Bodenheimer, Peter H.; Huang, Xu (2011). "Evolution of Ohmically Heated Hot Jupiters". The Astrophysical Journal. 738: 1. arXiv:1101.3800v4. doi:10.1088/0004-637X/738/1/1. ^ a b Spiegel, David S.; Madhusudhan, Nikku (2012-09-01). "Jupiter will Become a Hot Jupiter: Consequences of Post-main-sequence Stellar Evolution on Gas Giant Planets". The Astrophysical Journal. 756 (2): 132. arXiv:1207.2770. Bibcode:2012ApJ...756..132S. doi:10.1088/0004-637X/756/2/132. ISSN 0004-637X. ^ Grunblatt, Samuel K.; Huber, Daniel (2017-12-01). "Seeing Double with K2: Testing Re-inflation with Two Remarkably Similar Planets around Red Giant Branch Stars". The Astrophysical Journal. 154 (6): 254. arXiv:1706.05865. Bibcode:2017AJ....154..254G. doi:10.3847/1538-3881/aa932d. ^ Route, Matthew (February 10, 2019). "The Rise of ROME. I. A Multiwavelength Analysis of the Star-Planet Interaction in the HD 189733 System". The Astrophysical Journal. 872 (1): 79. arXiv:1901.02048. Bibcode:2019ApJ...872...79R. doi:10.3847/1538-4357/aafc25. NASA: Global temperature map of an exoplanet* First known theoretical prediction about existence of Hot Jupiters – by Otto Struve in 1952. "Proposal for a Project of High-Precision Stellar Radial Velocity Work". Otto Struve proposal, July 24, 1952. Audio: Cain/Gay Hot Jupiters and Pulsar Planets – Sept 2006.